Cut it into small pieces and set aside. Meanwhile grind together 'To Grind' ingredients and reserve. In an earthen ware/manchatty, add the marinated shrimp, chopped ridge gourd, green chilies, ginger and water. Cover and cook for ten minutes or till the ridge gourd and shrimp is cooked and soft. Add the ground coconut paste and add it to the cooked shrimp and veggie and bring to boil. Simmer the heat to medium and let it boil for another three-five minutes. Take off the stove and add few curry leaves. Heat up a small pan, add coconut oil, add mustard seeds and let it splutter. Add dry red chilies, curry leaves, chopped shallots/onion. Saute till shallots/onion turn light brown. Pour over the curry and keep it covered till ready to serve. Curry tastes better after couple of hours of making. Serve it with boiled Rice/Roti. I too love this combo,looks so yummy dear. very inviting and yummy curry dear !! 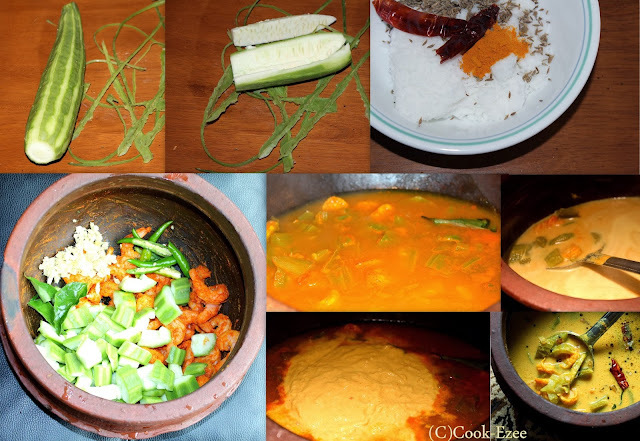 Curry looks good, might be I'll do it leaving out the prawns..
this combo is new 2 me but luking really awesum..love dat pot actually..
Peechinga chemmen curry kollam, Najan ithuvare peechinga curry vachittilla. such an interesting combo, drool worthy curry!!! This is a unique recipe and am going to bookmark it. thanks for posting.